A man and his granddaughter believe an empathic cat’s ability to comfort the dying is also related to its uncanny knack for survival; which leads to a series of adventures. An empathic cat can comfort the dying, but can the cat also sense death on other levels? People who try to harm the animal learn a hard lesson, while the cat’s owner, his daughter, and his granddaughter grapple with the meaning of it all. Daphney and her grandfather Bill are caught up in a series of adventures during the cat’s lifetime as a little girl grows up; while her grandfather grows old. Bill finally determines that the mystery surrounding the cat lies in the hereafter; a place where Bill cannot go until after he dies. Or can he? This is a great story and easy to read. For all you cat lovers you will love it. If not a cat lover, you will enjoy it also. My husband doesn't care to read (only magazines about fishing) but he read it in two days. Now that says alot about the story. It makes you want to read onto the next chapter to see what happens next. I promise you won't be disappointed. 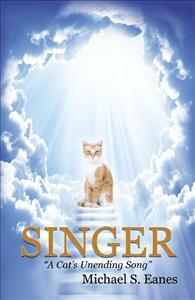 Buy it and start reading about Singer the cat.